A temporary break in the upper ridge across Mediterranean and central Europe today, as a decaying upper low from S France pushes a wave across the Alps. A new short-wave develops over the Bay of Biscay and pushes into W France. Deep low W of Scandinavia moves NE and provides some convective activity over central Sweden. An ENH risk has been issued for the southern Alpine flank across SE Switzerland, part of N Italy, NNE Slovenia, S Austria into NW Hungary with threat for scaterred severe storms, capable of producing severe winds, large to very large hail and torrential rainfall with flash floods. A decaying upper low coming from the SW Europe acts as a wave crossing the Alps and provides some ascent for storm initiation by early/mid afternoon. A moderate shear and rather strong instability with upper 10s to low 20s SFC dewpoints are favorable for organized severe storms, including intense multicells and a few discrete supercells. While large hail and severe winds are the primary threat, slow moving storms should support flash floods as well. Some clustering of the storms is likely later in the afternoon with more severe wind threat when storms spread across SE Austria, NE Slovenia towards W Hungary and diminish at night. 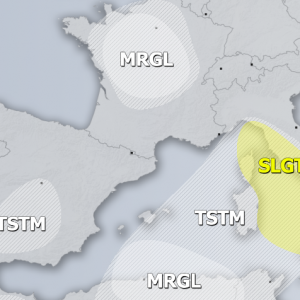 A SLGT risk has been issued for areas surrounding the ENH risk across N half of Slovenia, N Italy, W Hungary, Austria, S Germany into north-central France where some isolated severe storms are possible, capable of producing large hail, severe winds and heavy rainfall. 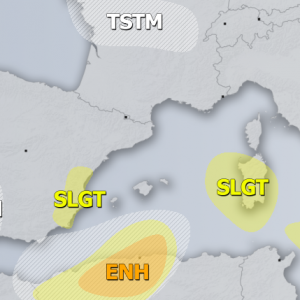 Additionally, a new short-wave approaches France from the Bay of Biscay towards the evening, new severe storms are expected to develop, but rather limited shear does not support higher severe threat to warrant an ENH risk. Despite widely scattered storm activity with locally a lot of rainfall, severe threat will be rather isolated. 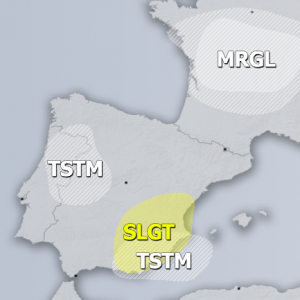 A MRGL risk has been issued surrounding the ENH/SLGT risks across W Hungary, Slovakia, Czech Republic, Slovenia, south-central France into N Spain where some isolated threat for storms exists, marginal shear and instability could support some intense cells, capable of producing strong winds and marginally large hail. A MRGL risk has been issued for Baltic states into central Belarus and N Ukraine with threat for some marginally large hail and severe winds with rather scattered storms, while only the strongest cells could bring some severe threat.